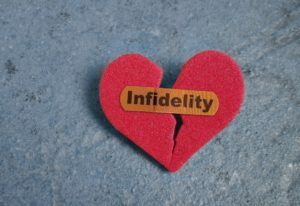 Infidelity and Divorce in Massachusetts - Amaral & Associates, P.C. the present and future needs of the dependent children of the marriage. and the contribution of each of the parties as a homemaker to the family unit. As you can see, infidelity is not one of these factors. However, infidelity falls under the “conduct” factor. Thus, when determining property division in a divorce, the Probate and Family Court must consider 17 different factors, and only one part of these 17 factors will include infidelity. However, realistically, if each Probate and Family Court judge heard about every instance of infidelity, they would never be able to leave the bench. Each judge would be on the bench 24 hours a day, 7 days a week, 365 days a year. Since that isn’t practical, the court limits arguments regarding infidelity are strictly limited to any dissipation of marital assets on the extramarital relationship. That means if a spouse spends marital funds and marital assets on their extramarital relationship, a judge can consider that a factor in property division. However, realistically, judges will typically only consider this argument if a substantial amount of marital funds were spent on the relationship. If money was spent on an occasional date here and there, a judge isn’t going to consider that. However, if a spouse went on vacation with their new significant other, that is something a judge may consider in property division. Therefore, infidelity can technically be considered in property division, but it is very narrowly construed by Probate and Family Court judges, so they are not on the bench all day, every day. Another topic where infidelity can be an issue in a divorce is with custody and parenting time. When spouses are working out a parenting plan, it is not uncommon to restrict the parties from introducing the children to new significant others. Thus, if one or both parents are already dating while the divorce is pending, they can agree to not introduce significant others to the children until it is a serious relationship. Oftentimes, this means putting a time restriction before parents can introduce significant others to the children. This can be a few months, or even up to a year. 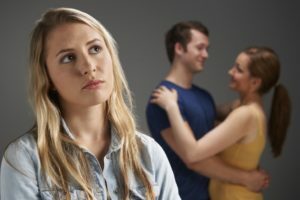 Also, if a parent is already in a serious relationship where he/she has already moved in with their new significant other, or is about to move in with their new significant other, sometimes the other parent can request background information on that significant other, and can sometimes even go so far as request for the court to perform a background check. However, the court is careful on the extent that a parent can look into this person’s background. Oftentimes the court will limit the background information to whether the new significant other has a criminal background and/or if the new significant other has any prior involvement with the Department of Children and Families. Having a new live-in significant other does not give the other parent carte blanche to do an unlimited background investigation.